End of life care can be a difficult topic to discuss, but it’s an important discussion to have. 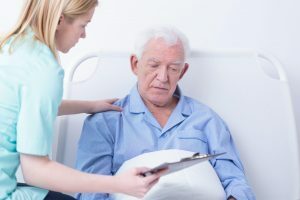 One study found that 80% of people said that if they were seriously ill, they would want to talk with their doctor about end of life care, but that only 7% had done so. There are a range of issues that can help you decide what types of care you do or do not want to receive, what your goals and concerns are, and how you want to spend the time you have. Talking with your doctor can help you gather information that can guide your decisions so you can develop a plan that meets your goals and respects your beliefs. What is my prognosis? What is the likelihood that I could be cured? What is your projection for how much longer I will live? If I decide to undergo treatment, what effect may it have on prolonging my life and how will it impact my quality of life? What types of side effects does the treatment have and how severe are they? What is the recovery from surgical treatment like and how long does it typically take to recover? What are the potential risks of treatment? What are the best and worst outcomes you’ve seen from this treatment? If I decide not to undergo treatment, how much longer may I live? What types of symptoms and problems could I experience as my disease progresses? What are my goals and priorities? What do I want to be able to do in the time I have left? What are my concerns and fears about the disease and the treatment options? Do I want to pursue all possible treatments or are there some I would prefer to forego because of the potential impact they could have on my quality of life? Do I want to spend my remaining time in the hospital or do I want to be at home? How much information do I want my doctor to share with me and how involved do I want to be in making decisions about my care? Ideally, you should think about your goals and priorities and the types of care and interventions you do and do not wish to undergo before you face a serious illness or injury. You’ll need to complete several legal documents to ensure your wishes are followed, including a living will or advance directive, durable power of attorney for healthcare, and a Do Not Resuscitate order (DNR) if you don’t want CPR or other medical interventions if your heart stops. Making an advanced care plan and choosing a healthcare proxy while you’re still healthy can help ensure you receive the care you prefer and remove the stress of making end of life care decisions from your loved ones.